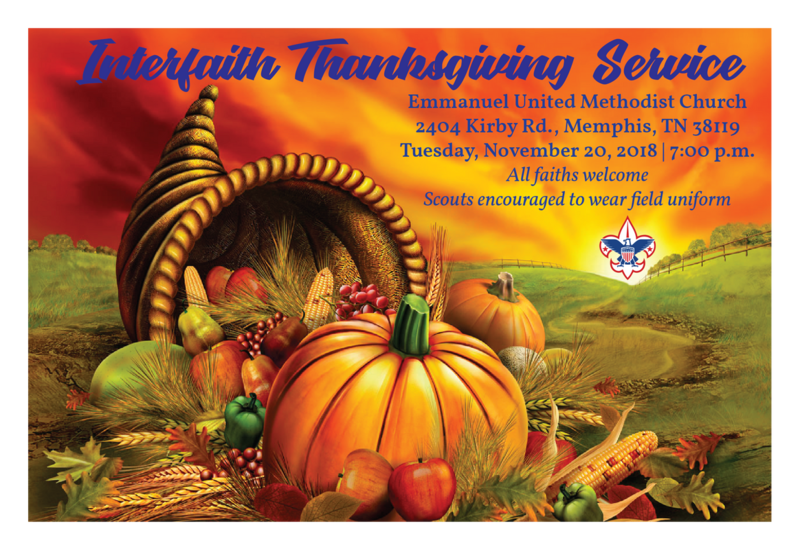 The annual Community Interfaith Thanksgiving service will be held at Emmanuel United Methodist Church 2404 Kirby Road, Memphis, TN 38119, on Tuesday, November 20, 2018, at 7:00 p.m. Christians, Muslims and Jews come together at this annual event to give thanks to God. Scouts from a number of units, including Troop 25, have participated in this event for years. We encourage all units in the Memphis metro area to send Scouts and their families to this prayer service to do our duty to God and live being reverent. Scouts are encouraged to attend in the field (Class A) uniform.